My card for today is for Taylor's Cupcake Challenge #45. Sometimes when there are ovals on sketches, my creative flow completely halts. I'm not sure why -- I guess I'm more of a square/rectangle person! 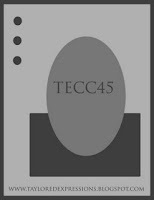 This time I envisioned my card right away and the design in my head progressed quicker than my hands. I was excited to use a sheet of Basic Grey Mistletoe & Pear patterned paper -- isn't that pretty? I was surprised to see it at Michael's a few weeks ago. It wasn't a line that I had heard they announced, so I thought maybe it was older. It was new to me, so I decided to pick it up. It turns out that it was new this year, but exclusive only to Michael's. 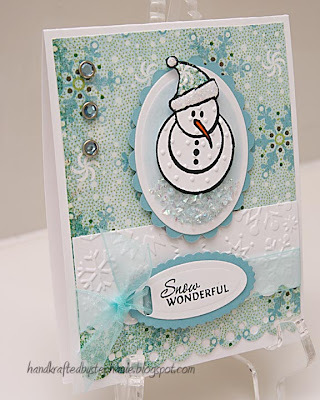 I used Verve's Snow Wonderful set and stamped my snowman, colored his nose and paper pieced his hat. I added Star Dust stickles to the top and bottom cuff of his hat. I sponged my oval while it was still in the die to achieve the blue background and finished off his "seat" with a fluffy bit of chunky glitter. I was also inspired by this card by Cindy Haffner. Isn't that adorable? She had embossed her image and I wanted to try it out on the snowman. Thanks for looking! Have a great weekend! I hope to get a lot of stamping time in! Cardstock: PTI, CTMH; Patterned paper: Basic Grey; Stamps: Verve; Ink: Memento Tuxedo Black, CTMH; Copic markers; Cuttlebug snowflake and swiss dots embossing folders; Nestabilities oval and petite oval; SU! slot punch; MS border punch and chunky glitter; Other: rhinestone brads, ribbon, sponge, boosters (confessionsofaribbonaddict.blogspot.com). This card is ADORABLE!! I just love these Verve Snowmen....great job with Taylor's sketch! this is snow sweet! Love the paper and then the nice bold image to draw my eye! Great way to attach the sentiment too! So cute, Steph! Love the embossed snowman image! I hope I get a lot of stamping time this weekend too! :) Have a good one! Super cute card! Love the great colors and the cute image. Great job on the sketch. TFS! Steph this is so sweet I love your snowman. Isn't it fun to make snow with that folder. Have a great week-end.